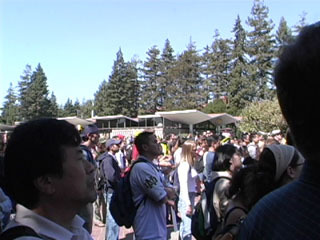 I had an interesting time at the Rally at Sproul Plaza in Berkeley on September 16, 2003. I won't say it was "fun" or anything, because it wasn't, really. More on this below. My first problem was that I had left late from school and I missed the first part of the speech. The second problem was that I had been up till 2:00 am the night before posting Cheney on Meet The Press clips. So I only got the last third of the speech (see below). 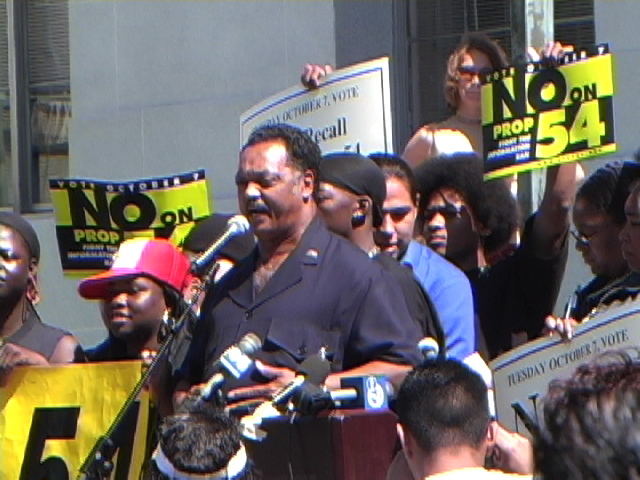 I was quite excited when I got to interview Jesse Jackson for a minute, but otherwise, it was kind of a mean crowd. Or, should I say "immature" crowd, at best. They had no respect for my camera, for instance. And one jerk even thought it was funny to push it over on purpose, once he realized I was trying to protect it. I guess I've been spoiled for the most part at these kinds of events in the past, where everyone has been really nice and ducked when they walked in front of the camera and helped me to reach better views and the like. This crowd just wanted to get autographs after Jesse's speech and they were pushing and shoving really badly. 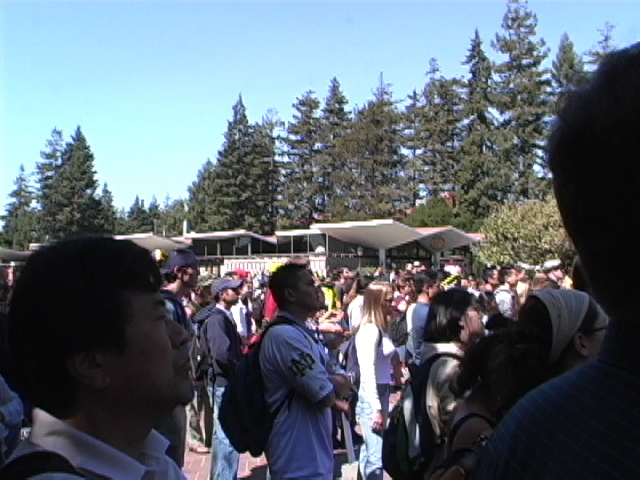 I decided to go stand on the stairs of Sproul Hall and try to get a better shot from up above. (I had given up on actually talking to Jesse). I guess the crowd's attitude toward me could have been partly my own fault from trying to maneuver in the crowd with a tripod, so I ditched the tripod and was trying to figure out how to get close again when...the usual miracle happened (Yes, I do have incredible luck at these events!) and Jesse started walked over towards me on the stairs. His security people were holding back the crowd a bit, so I waited until he was close enough for him to hear me and took a chance on asking him a question. He didn't hear me the first time, so I asked him again. I saw a light go off when he heard the question, and he stopped signing for a minute and looked up and said "Huh?" "Do you think the 9th Circuit Court of Appeals Decision about the recall will hold?" I asked again. Then he paused and thought for a minute, and gave his answer.